Diagnostic Features - Antennae 11- (former Parasyscia) or 12-segmented, the apical funicular segment greatly swollen, forming a club. Genae longitudinally carinate, eyes present. Petiole a massive node, never marginate laterally. 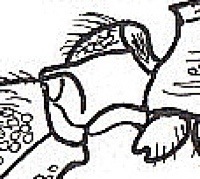 The gastral constriction may be extreme, so that in some species there is a petiole and a post-petiole. Middle and hind tibiae with two spurs, claws simple. Smith's (1857a) genus definition is at . Emery (1902c) gave revisionary notes - these are at . Described as uncommon by Bolton (1973a), who remarked that all known species raid the nests of other ants for food. They are generally specialist feeders on other species of ants, hence the armoured nature of the body (Hölldobler & Wilson, 1990, page 569). Brown (1975) observed Cerapachys species in Madagascar and India attacking nests of Pheidole species. Brown (1975) separated the African species into the following groups: the wroughtoni group, from S. Africa, of small species, with 12-segmented antennae, the eyes minute or absent, and promesonotal suture well developed; the cribrinodis group (centurio, cribrinodis, sudanensis and villiersi from West Africa and the Congo Basin); the mayri group (coxalis, foreli, and nkomoensis from West Africa and the Congo Basin); and indeterminate (decorsei and similis). 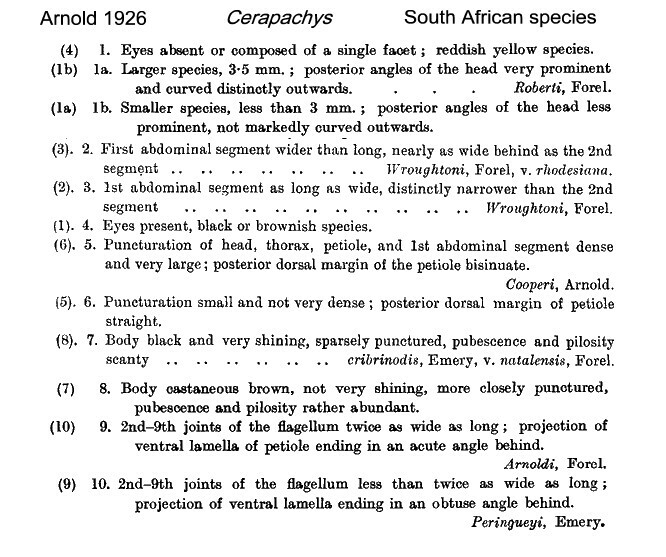 Arnold (1926) gave a key to South African species, this is at . Brown's (1975) key is at . Brady et al. (2014) provide evidence from DNA studies that within Cerapachys the group with marked lateral margination on the petiole was distinct enough to perhaps warrant elevation to genus status under the name Lioponera (type species longitarsus Mayr 1879: 666, type location India). As yet, however, that seems to remain invalid as a formal published genus. See the subfamily page (link above) for more information. The species keyed from 5 below would be Lioponera, plus the Senegal specimens that may be the previously unreported workers of noctambulus. 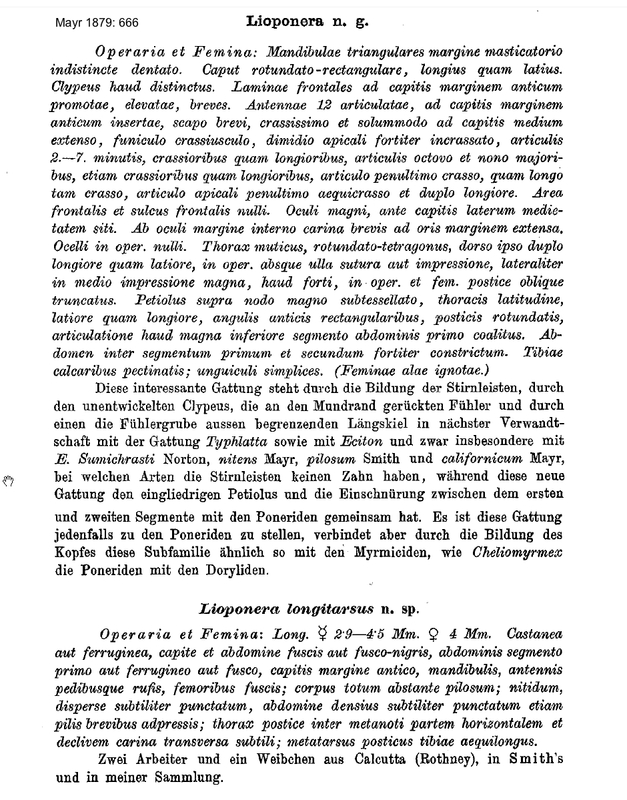 Mayr's (1879) description of Lioponera, with longitarsus is at . See Cerapachys longitarsus. Worker. 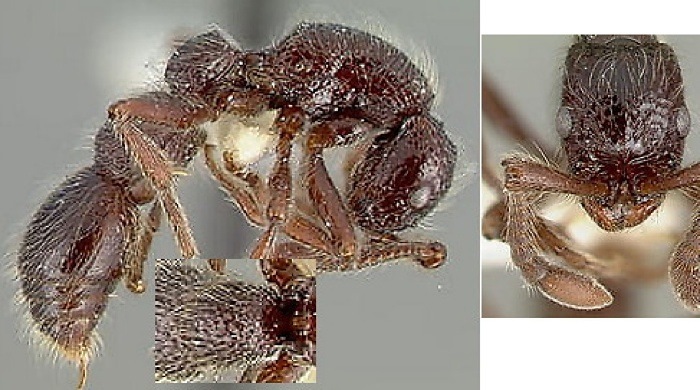 Cerapachys belongs to non-army ant dorylines with spiracle positioned below midheight of the propodeum and pygidium well-developed, armed with modified setae. 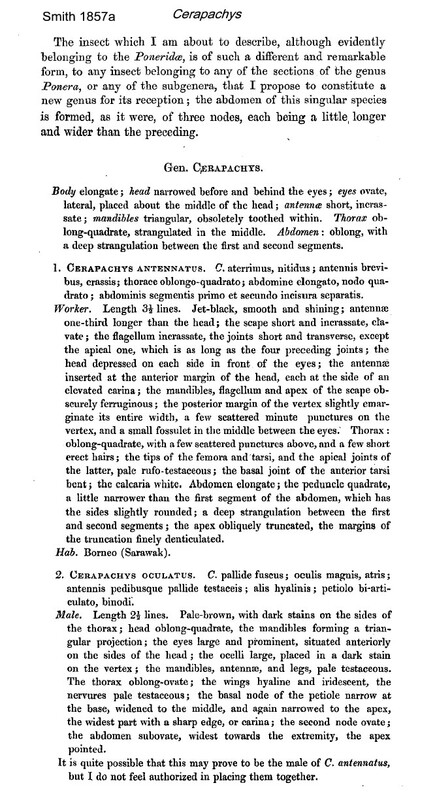 It has a well-developed carina on the pronotal collar and a distinct pronotomesopleural suture, a single pectinate spur on each mid and hind tibia, and helcium positioned supraaxially, above midheight of abdominal segment III. Some species have pretarsal claws armed with a tooth. 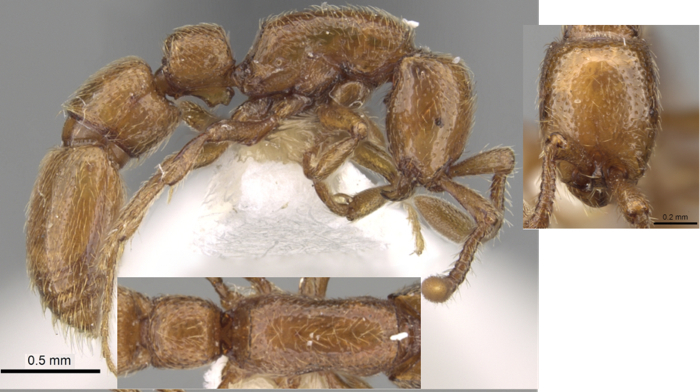 Cerapachys is a genus of medium-sized, universally dark-colored ants that could be confused[with] Lividopone. Distributions of the two genera do not overlap, however, with Lividopone being so far known only from Madagascar. Lividopone is further distinguished by almost complete fusion of pronotomesopleural suture, which is unfused in Cerapachys. Lioponera overlaps in range with Cerapachys and certain species can be superficially similar but a more narrow and axially positioned helcium, dorsolaterally carinate petiole, and a flange on the posteriorface of the coxae will distinguish Lioponera. 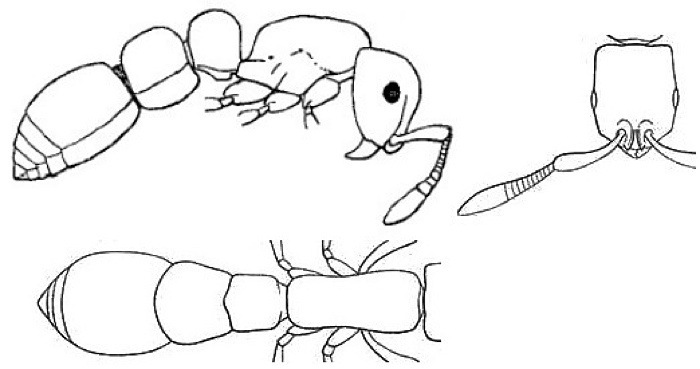 In his key (couplet 14) the presence of a tooth or small denticle on the hind leg claws separates some Cerapachys from Lioponera, Parasyscia and Zasphinctus (separations as below); other Cerapachys have a deep "pronotomesopleural suture" which is absent on the non-Cerapachys (couplet 19). Key to workers of species known from Africa (after Brown, 1975) - nomenclature from Borowice (2016) is shown. -- TL ca 4 mm; distinctively bicoloured with dark red-brown posterior to gaster contrasting to rest of body; workers speculatively associate with type male (image on species page). If so, the former synonymy under longitarsus was wrong. That has 12-segmented antennae, smaller eyes, shorter erect pilosity and a relatively small near circular postpetiole when seen from above. 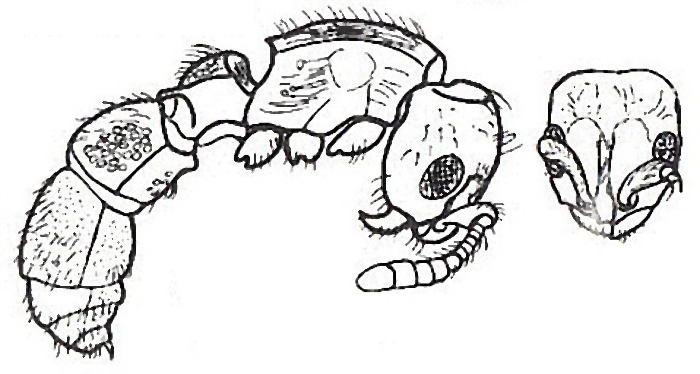 3 TL 3.5 mm; smooth and shiny with almost whole of head and alitrunk with large pits from which a yellowish hair arises, finer pits on the posterior four segments of gaster; antennae and legs with very fine decumbent pubescence; ferruginous yellow with apex of gaster browner [nothing given by Brown, 1975] - Parasyscia . 7 Head smooth; TL 3.5-3.7 mm; dark brown to black - Lioponera . 9 Eye small < length of apical segment of funiculus; TL 3.4 mm (Kenya) 4.2-4.5 mm (South Africa); - Lioponera . 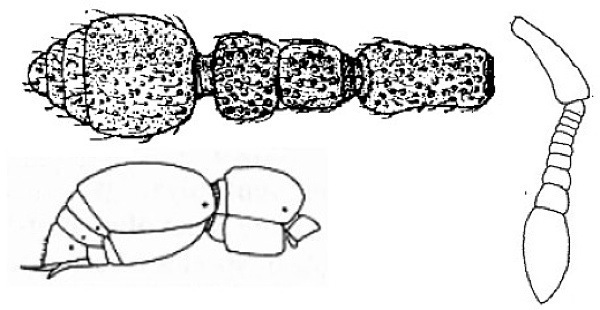 -- Eye larger > length of apical segment of funiculus; TL 2.8 mm (Nigeria slightly larger); black - Lioponera . 15 TL 4.0 mm; petiole with median point in posterior margin, dorsum in profile convex; ventral lobe of petiole with distinctive angles at anterior and posterior; castaneous - Parasyscia . -- TL 2.4-3.0 mm; black; petiole with flat dorsum in profile - Parasyscia . 16 TL 4.3 mm; dorsum of head, alitrunk and pedicel very finely roughened and opaque; first gastral segment with very fine dense puncturation on shiny surface; black - Parasyscia . 19 TL 2.7 mm; pale burnt sienna brown - Parasyscia . 20 TL 2.6 mm; head, alitrunk and petiole with large deep puncturations; uniform brown-red, shiny, appendages yellow - Parasyscia . 21 TL 3.7-4.0 mm; postpetiole with deep ventral process; sculpturation of small hair pits; blackish-brown, apices of body and appendages brownish-red - Parasyscia . Found in Ghana, by Belshaw & Bolton (1994b) in leaf litter samples from the semi-deciduous forest zone, with single workers from primary forest at Esukawkaw Forest Reserve, and secondary forest at Atewa Forest reserve and CRIG. From Ghana in a cocoa canopy sample, by Room (1971).